When we think of gardening with children, the first thing that comes to mind is often vegetable or kitchen gardening. Have you ever considered wildlife gardening? It is a whole new way to enrich your children's lives. 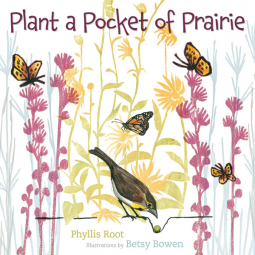 In this vein, Plant a Pocket of Prairie by Phyllis Root and illustrated by Betsy Bowen is an exciting new picture book coming out April 15, 2014. It explores the prairies of Minnesota, but has a much more general appeal and a serious message that can apply anywhere. The first thing you notice about the book when you open it is Betsy Bowen's gorgeous woodcuts (children might like to see how she does them). They are so clean and vibrant, they make you want to hang the book on the wall. 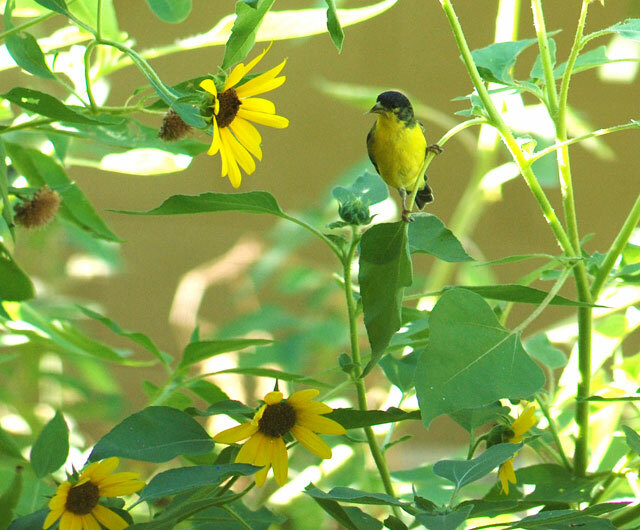 She then highlights examples of relationships between specific plants and animals in the prairie ecosystem, such as between foxglove beardtongue (a type of Penstemon) and hummingbirds; monarch butterflies and milkweeds; and goldfinches and sunflowers. The back matter includes lists of mammals, birds, reptiles and amphibians, insects, and plants commonly found in prairies. Did you know that the prairie is one of the most endangered ecosystems in the world? In the back matter the author also explains that less than one percent of native prairies remain. 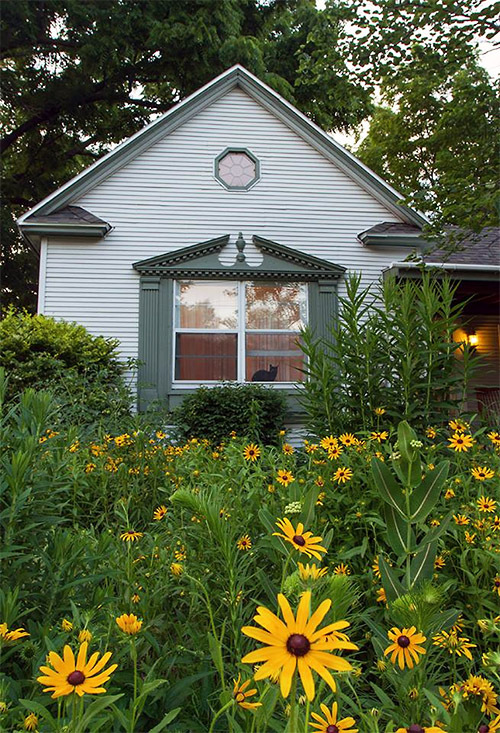 Her premise is that if you plant a pocket of prairie in a backyard, lot or even in containers, some of the animals she identifies might come to visit. If enough people plant pockets, more struggling plants and animals might survive. If everyone who lives where prairies once occurred were to plant a "pocket of prairie," who knows what might show up. The illustrations suggest a bison, giving the children a concrete idea of the big things that could happen. Which is really what Plant a Pocket of Prairie is all about, it is a little book with a big idea that could enrich our world by inspiring people to grow native plants. Are you ready to grow native plants? How do you start? If you want to start a prairie, of course the first question is: what is a prairie? The word comes from a French word meaning "meadow." Typically prairies are expanses of grasses mixed with other plants, but with few or no trees. How would you go about it? Here in Arizona it is not uncommon to see yards with absolutely no lawn, but in most areas an expanse of lawn is still the norm. One step could be to carve out areas from that lawn and start adding beds and borders of a mix of native perennials. Over time, you could continue to expand the beds until you reach the point where you can throw away the lawnmower. Wonder what it might look like to replace the lawn with a meadow? This is Alex Wild's prairie yard. (Copyrighted photograph of photographer Alex Wild's meadow yard used with permission. See more of Alex Wild's work at SmugMug.) Includes "black-eyed susans, prairie milkweed, New England aster, ironweed, and blazing star." Isn't it wonderful? Of course you'll want to include paths so your children can run through and explore. Imagine all the wildlife they would be able to experience first hand. Not ready to convert the whole yard? If you already have flower beds or pots, simply throw away the geraniums (which produce absolutely nothing for wildlife) and grow plants that are naturally found in your area, such as purple coneflowers and penstemons, instead. Another idea is to simply not be so neat and tidy. Allow some "weeds" to flourish in the corners and along banks, etc. When you see butterflies or birds visiting, point them out to the members of your community so they become interested, too. Side note: Right now people are focused on the plight of the monarch butterfly, because the numbers are declining so rapidly. Although encouraging milkweeds is a wonderful idea to help out, be sure to plant other native plants as well. Diversity is the key. Because every region has its own naturally-occurring plants, it can be a daunting task to find out what to plant and where to find material. Fortunately most states have native plant societies with information to help out. The American Horticultural Society has a list of native plant societies by state, with addresses and links to websites. Still have questions or have information to share? If you have ideas about wildlife gardening for kids or if you are interested in learning more, please leave a comment. Build-a-Prairie is an online interactive game from the Bell Museum that is fun and educational (I recommend consulting the field guides provided :-)). It gives the important message that plant choice is critical. The Home Bug Gardener blog recounts a transition of a yard in Canada over several years to an "oasis of biodiversity" (check older posts first, as currently the author lives in Australia). Thank you for visiting us during Children's Garden Week. 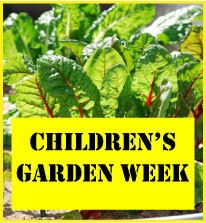 Don't forget to check the Children's Garden Week organizational post for updates as well as visit our Gardening/Science Activities for Kids Pinterest board. Disclosures: This book was provided for review electronically via NetGalley. Also, I am an affiliate for Amazon, and if you click through the linked titles or ads and make a purchase, I will receive a small commission at no extra charge to you. Proceeds will be used to maintain this self-hosted blog.